that's what I want to say to him. I like the grass and also the text. I wanted to make a despair situation, where Nozomu Ithoshiki hangs himsef. Still a +fav for totally capturing the mood of Nozomu. it's pretty funny to see in a glance that we can't really notice someone is hanging himself... it takes me some time to scrutinize every corner of ur wallpaper before noticing it. but overall i thought this wallpaper is good. i like the mood. it's now my wallpaper. All the trees' details surely took you long hours of frustration. Albeit, the text could have been more aligned. It doesn't blend very well, and stands out too much. So... eerie. Reminds me of the Bible. Oh.. this is amazing! Love the texturing and the black and white. It's so beautiful! 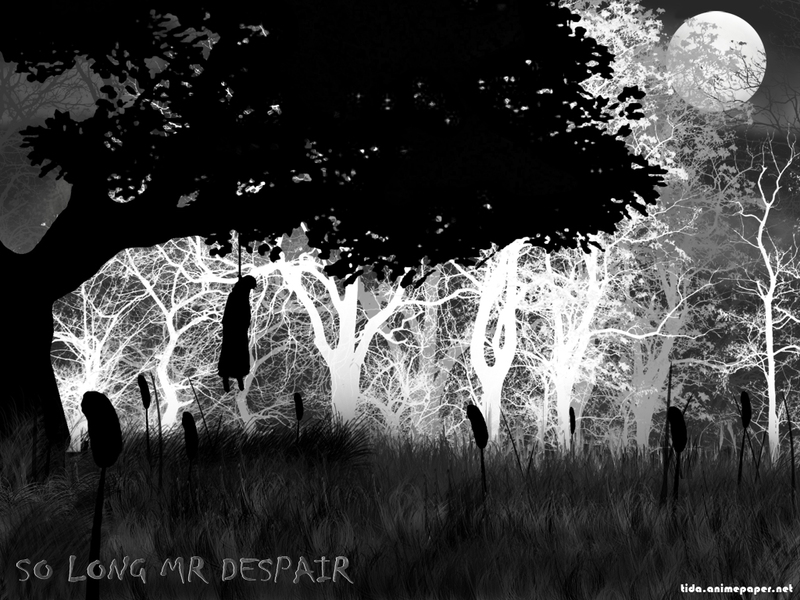 i want to know..why does he always in despair? such a terrifying yet so beautiful walli.....but i must say AWSOME PICTURE!